21 Lancefield Quay, Glasgow. G12 8HH. Demolished. This old established pub dates back to 1851. Landlord Mr Woodburn lived at the Kirn Hotel, Dunoon. 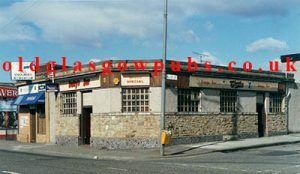 The pub was well known in Victoria times as J B Turner’s, other names the pub has had is Hill’s Bar, named after owner Robert Hill. When Daniel Hurrel took over the business he renamed it Betty’s Bar after….. to read more on the history of this pub, please check back soon for our second book. Above are: Mr. F. H. Robertson, Usher’s; Mrs. and Mr. D. Hurrell, Betty’s Bar; Mrs. F. H. Robertson; Mr. A. Deans, Carlsberg; and Mrs. & Mr. P. A. Anderson, Gordon Arms, Gallowgate. 1974. Other pubs the Hurrel family have owned.